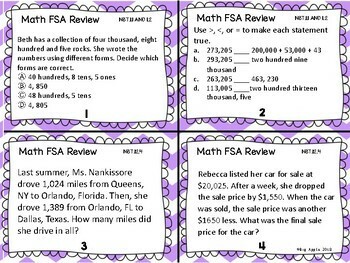 There are 24 FSA style questions (adding/subtracting fractions, decimals, multiplication, division, measurement, place value) to review for the FSA or similar state assessments.You can use as a scoot game or place in center. 2 sets of task cards (24 questions each w/ answer key). You can use as a scoot game or place in center. I hope you will find this resource fun and engaging!